Dittersdorf was in fact born Ditters, and it is only late in his life that he acquired the title of nobility “von Dittersdorf”. Born in Vienna, he was one of those numerous and talented composers who vied for success in the second half of the 18th Century in the capital of the Austrian empire, although, like his good friend Haydn (not born in Vienna but trained there), his engagements at the service of various princes and nobility soon led him away to more remote parts of the empire. Imagine Dittersdorf, Haydn, Mozart and Vanhal playing string quartets together – they did, in the mid 1770s! Now of course Dittersdorf is among the vast throng who have been dwarfed in the eyes of posterity in the shadow of the holy trinity Haydn-Mozart-Beethoven. But like so many, his music is often enjoyable, if you are into the pleasures of the Classical style, from galant to pre-Romanic “Sturm und Drang”. As with so many (now considered) “minor” composers from the era, I started listening to Dittersdorf to better understand the environment from which grew Haydn and Mozart, with the pleasures afforded by the music a by-product, so to speak, of that musicological investigation, but I end up, as always, just enjoying the genuine pleasures afforded by the music, with the musicology becoming a mere by-product of the listening. Concerto for Double Bass No. 1, Sinfonia Concertante for Viola & Double Bass Concerto for Viola. Lubomir Malý, František Posta, Dvořák Chamber Orchestra, František Vajnar. Supraphon 11 0951 2 (1993). A VERY boring disc – but NOT because of the composer. Sinfonia in D minor Gr. d1 / F major Gr. F7 / G minor Gr. g1. Failoni Orchestra, Uwe Grodd. Naxos 8.553974 (1998), barcode 730099497428. A bit disappointing, this one. The music is pleasant but plumbs no depths. Sinfonia in A minor “Il delirio delli compositori, ossia il gusto d’Oggidi” Gr. a2 / Sinfonia in D major “Il Combattimento delle passioni umani” Gr. D16 / Sinfonia A major “Sinfonia nazionale nel gusto di cinque nazione” Gr. A10. Failoni Orchestra, Uwe Grodd. Naxos 8.553975 (1998), barcode 730099497527. And then you have the extraordinary and hugely original Symphony in C major for large orchestra “La Prise de la Bastille”, recorded by Concerto Köln in 1989 on their program “La Prise de la Bastille: Music of the French Revolution” (with works of Davaux, Martin, Dittersdorf, Gossec), on Capriccio 10 280: “a magnificent work, richly orchestrated, powerful and dramatic, with pre-echoes of Beethoven’s revolutionary might and high-spirits (just try the beginning of the finale)” as I write in my review. Little is known of the circumstances of composition, and Dittersdorf is not known to have travelled to Paris in the decade of the revolution (in fact, I don’t know that he ever did, although I do think that some of his works were published in Paris). Well, sure. It turns out that the symphony is not by Dittersdorf, but by an obscure Flemish hornist and composer, Othon-Joseph Vandenbroecke (1758-1832, also spelled Vandenbroek, Vandenbroeck, van den Broeck, or van den Broek). I don’t know how it became attributed to Dittersdorf, but there went my theory about Dittersdorf unrecognized genius. Now I have a theory about Vandebroecke’s unrecognized genius. Dittersdorf catalog numbers for the symphonies, from the modern catalog estalished by Margaret Grupp Grave (1977 revised 1986), with the corresponding numbers from the 1900 catalog of Carl Krebs. Priceless, when you are trying to sort out who recorded which symphony. And, from the same website, here’s the index to the catalog of the other works. Dittersdorf’s autobiography (link will open a .pdf document under a new tab), completed three days before his death, in an English translation by A.D. Coleridge – not the poet, Arthur Duke, an English lawyer and amateur musician, but thanks anyway. As I was working on this entry, I compiled for my own use a further discography of Dittersdorf – stuff that I don’t have in my collection. It doesn’t claim to be complete, just a primer (in particular, I’ve left out the ubiquitous Harp Concerto, as well as the instrumental sonatas and keyboard music), but I thought I’d share. 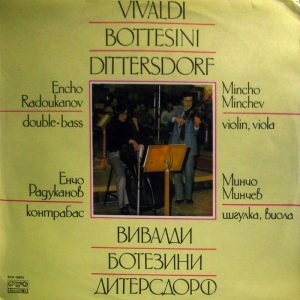 A list of LP recordings of Dittersdorf’s Concertos and Sinfonia Concertante for double bass. Note: Poor violist and double bass players K. Schouten and B. Spieler almost seemed condemned to have their first name reduced for eternity to a mere initial, because that’s how they are listed on every edition I’ve seen of this Telefunken LP. I had an especially hard time establishing that the B. of Spieler stood for Bernard, because “spieler” in German means player, and of course any search on Kontrabass Spieler would yield some double bass player! It is thanks to one track from the 10″ mono Telefunken BT 5024-E / D-117 “So Oft Ich Meine Tobackspfeife”, with your hallowed group of early Dutch period-instrument players Leonhard and Bylsma, that I was able to return him his complete name…. Conductor André Rieu is not the infamous crossover saccharine violinist… but his dad. Concertos (CD) listed in rough chronological order of publication. Some of it is in shorthand but I think it’ll be clear to all. Links will open new tab to various website where you can view cover art when not available on the various Amazons. Same. Evro Productions Luxembourg EVCL593045 (publication date unknown), no barcode, found on different Amazons under barcode 3254872652745. Many thanks to record collector Alan Pearcey for kindly providing the information on that one. According to the website linked above with Dittersdorf’s catalog numbers, these are NOT the “complete” Oboe Concertos. Jay D. Lane, whose catalog of Dittersdorf’s Concertos (from his 1997 Yale PhD dissertation “The Concertos of Carl Ditters von Dittersdorf”) is now authoritative, lists seven extant Oboe Concertos (four in C major, two in G major and one in D-major) and one for Oboe d’amore in A major. Lencsés then leaves out one in C and one in G. In particular, the G major that he plays is not the same as the one played by Heinz Holliger on the Early Viennese School Archiv collection which I have (and referenced above), L42 vs L41. And with all that, in the (no so abundant) CDs I’ve located featuring symphonies of Dittersdorf, the only duplications (leaving aside the Ovid Symphonies and the Andantino for oboe and orchestra from the very elusive “Symphony in D major” – Dittersdorf composed 34 symphonies in D major, and that’s not counting those of dubious attribution) are the Symphony in A major A10 “In the taste of five Nations” (conducted by Romeo Rîmbu on Olympia’s vol. 3, OCD 426 and on Naxos’ 8.553975, conducted by Uwe Grodd) and the Symphony in A minor Grave a1 (Camerata Bern under Thomas Füri on Archiv’s collection “The Early Viennese School”, and Romeo Rîmbu on Olympia vol. 2, OCD 425).